Tim Jenkinson rides to an excellent 6th place in the Short Track. The 2011-2012 collegiate racing season started for Mars Hill Cycling at ETSU last weekend, giving the team its first opportunity to see how it stacks up to the competition and how it fares in defending last year’s #1 national ranking in Div II. The Southeastern Conference is one of the most competitive in the nation, and some of our new riders were impressed by the speeds, realizing that there’s plenty of work to do. Looking back at last year’s season opener, however, which was also at ETSU, reveals that we’ve made a step up in overall performance, realizing one of the team’s primary goals: continuous improvement. Every rider that competed last year at ETSU improved upon their placing this year. Short track events started the weekend, and we had riders competing in three categories: Men A, Women A, and Men B. The course was an undulating and fast two minute lap, punctuated by a small jump and a rock garden, both of which could be opted out of by taking a longer route. In one of the larger fields of the weekend, Maitland Jones and Chad Capobianco rode strongly to 5th and 15th place finishes in the Men’s B race. Jones improved upon his 7th place from last year. Klara Rossouw earned a fine 4th place finish in the Women’s A race, also improving on last year’s 7th place finish. The Men’s A field was very fast with two riders (Union and UF) setting the pace off the front. Tim Jenkinson had a great start and held on to 6th place, a much better result than last year’s 28th place in the same event. Mikey Keith came back from a last place start to finish about 10th, while freshman Corey Davis finished a respectable 15th. In the afternoon, Marco Liubenov and Corey Davis competed in the gravity events: downhill and dual slalom. In the downhill, Liubenov had a couple of strong runs and finished in the top half. In the dual slalom, Davis made it to the quarterfinals before having to withdraw due to a mechanical, finishing a solid 4th despite. Liubenov had a solid qualifying run, making it into the final round of sixteen but had troubles competing after an injury sustained during practice runs. Last year, Liubenov raced in the C category but is now finding good results in the B category. On Sunday, the cross country race took place on a challenging figure eight course. The Mens’ A race was once again won by Victor Fastguy(?) of UF over Brad Perley of LMC, who everyone thought rather unbeatable. Tim Jenkinson and Mikey Keith, longtime friends and rivals, and now teammates on Mars Hill Cycling, finished in 9th and 10th. Last year Jenkinson finished 26th. Corey Davis finished in the top 20 in his first collegiate cross country event. And Klara Rossouw replicated her short track placing from the day before with another strong 4th. And Maitland Jones (despite “getting passed by everyone all the time”) finished 4th in the Men’s B race, which had 49 starters. 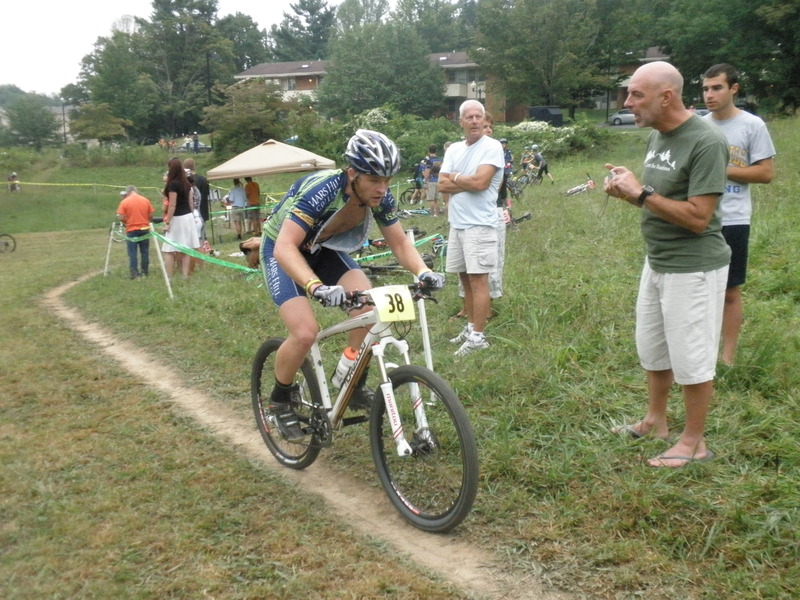 Chad Capobianco did well to earn a top 20 in only his second mountain bike race ever. In all, a great start to the mountain bike season. Returning riders showed marked improvement over last year, and new riders demonstrated that they will be a force for years to come. Find more photos at www.facebook.com/marshillcycling.com. In a raffle starting today, Hops & Vines, a longtime supporter of the team, will raffle off two tickets to the sold-out Brewgrass Festival with proceeds supporting the team’s trips to track and mountain bike nationals this fall. In case you don’t know, Brewgrass is a festival in Asheville that gathers over 40 American breweries and showcases over 120 different beers. In addition, they assemble regional and national bluegrass acts to perform. Proceeds from the festival benefit Big Brothers and Big Sisters of Western North Carolina. Bluegrass Festival is a notoriously hard ticket and always sells out. This year it sold out in seven hours. Raffle tickets are 1 for $5, or 5 for $20. The winner will receive both tickets. You can purchase tickets via credit card by calling Hops & Vines at 828.252.5275. You can also purchase raffle tickets during the store’s customer appreciation event this Friday from 4-8pm, which will include free appetizers, beer, wine, and even hop candy. They’ll also have a sale on homebrew equipment and a 20% sale on wines. The winner of the raffle will be announced at the end of the evening. We’re appreciative of Hops & Vines including us in their event. We think they’re the best beer and wine shop in town, so in the Best of WNC competition we’re going to vote them “Best Beer Shop” and “Best Wine Shop” in the Hunting and Gathering category. We think you should too! Click here to VOTE.